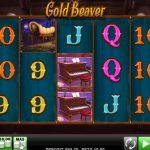 Gold Beaver is a video slot game that was inspired by the Wild West coming from Merkur Gaming. Well, the game took a slight turn when it comes to the theme and let you visit a saloon where a female beaver is dancing on the stage, strange right? Not really since in online industry everything is possible and the most unusual games are very popular for some reason. The design of the game is very simple and the reels are set inside the saloon with the brown being the dominant color. 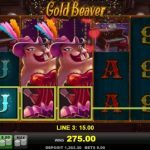 Gold Beaver is as simple as it can be. The game is played on 5 reels and it has 5 pay lines only. There is only one special symbol, the wild. The beaver dancer symbol acts as a wild and it appears on the second, third and the fourth reel only. The good news is that this is an expanding wild, so that means it is possible to land some good wins with the help of it. There are no other special features here, but that is for a reason, so the main focus is on the game itself. 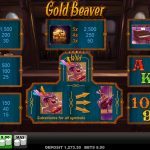 GoldBeaver is an interesting game with entertaining theme. Merkur Gaming is the name that stands behind this video slot and we have to admit that they did an amazing job creating this game. Their intention was to get back to basics we suppose. This is something that is in particular appreciated by nostalgic players who enjoy simple game play. This does not mean that the game does not have anything else to offer. We have a thrilling game play thanks to the expanding wild which can indeed go wild and if you are lucky you can and some really good wins with the help of it. For another great engaging slot you should consider playing Fruitinator a 5 reel slot by Merkur.